It is very exciting for me to be working with Driline Baby yet again (see my other review of their products, if you're interested). Working with Yasmin, the owner, here in my hometown continues to be a fantastic experience. This time around, in having to drop something off, I was able to visit the actual Driline factory here in the city where I live. It was fabulous to see a clean, safe workplace making diapers according to Canadian standards. The ethical component of buying or using Driline's baby diapers and goods is sound, and that's something that I know most of you are concerned about and will feel good about if you are able to try them. The men and women working in the production rooms seemed happy, and Driline was so well-stocked with amazing products and fabrics that it looks like they are set up to be providing diapers to families and hospitals for plenty of years to come! This time around, Yasmin wanted to have me review some of their newer products as well as some old fan favorites. She sent me their new Bamboo Baby bib, a hooded towel, a "Dri-Pad", and three Blue Dog fitted flannel diapers, with three accompanying liners. 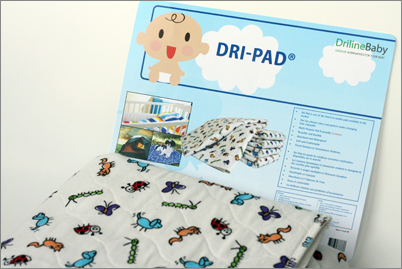 I will start with my absolute favorite product out of the bunch--the Dri-Pad soaker pad. 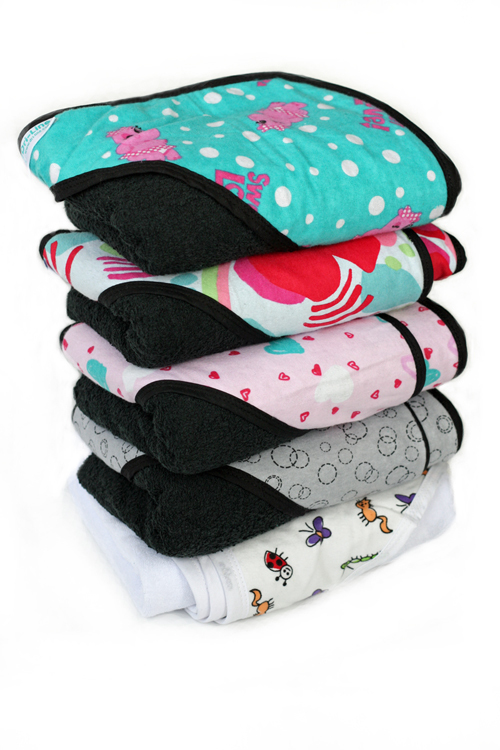 This pad comes in two different sizes (17"x24" changing pad, and 34"x36" crib/mattress pad). I was sent the larger of the two sizes, which would fit nicely under a crib sheet to help protect the mattress in case of leaks. I, however, loved using this for another purpose. We all know that diaper-free time is great for babies (whether in cloth or disposables) in helping to prevent rash. Aside from that, all babies also love having some good old fashioned naked time, particularly in the hot summer ;) I loved being able to set this pad in the playpen, or even on the floor itself, and allowing little Aurelia to play on it, even in carpeted areas. The top is a soft cotton good for sitting on, but this pad also has a totally leak-proof vinyl backing so that even when super saturated, the pad does not allow any leaks through it. Perfect for playtime (or sleeping naked, if trying to clear up a really nasty rash), this mat would also be perfect for Elimination Communication or potty training days. Or, for all your pregnant mamas, I was thinking this would also be terrific to slip underneath your own mattress sheet in case you're afraid of your water breaking or leaking while you sleep (I know I had a strange towel and garbage bag scenario rigged up on our bed, and this would have been much more comfortable and less noisy!). Honestly, now that I have a waterproof mat, I would say that this is a definite "must have" for all parents. I also love the cute "blue dog" print on it (and Baby loves looking at the colorful animals on it, too!). Yasmin also sent me a gorgeous hooded towel to try out. This hooded towel is great because the front side is a regular terry material (as all towels are), but the backside is completely covered in a cute flannel print, which then wraps over onto the hooded corner. At 11 months old, Aurelia has now outgrown the typical "baby" towels and needs something more hefty like this toddler-sized towel. I love the flannel side because I hate wiping her delicate areas dry with a harsh terrycloth, so it's easy to fold over the softer, flannel corner for toweling sensitive skin dry. There are so many cute prints available in these towels too, in boy, girl, or gender-neutral patterns! The Bamboo Baby bib that Driline Baby manufactures is very different from other bibs I have tried, so it's nice to have the versatility by having one of these bibs in your arsenal. This bib is significantly longer than other bibs I've tried, which sometimes can be too long, but in other cases provides the perfect protection I was looking for. For the past many months, I've been feeding our baby girl in a Bumboo booster seat on the countertop. 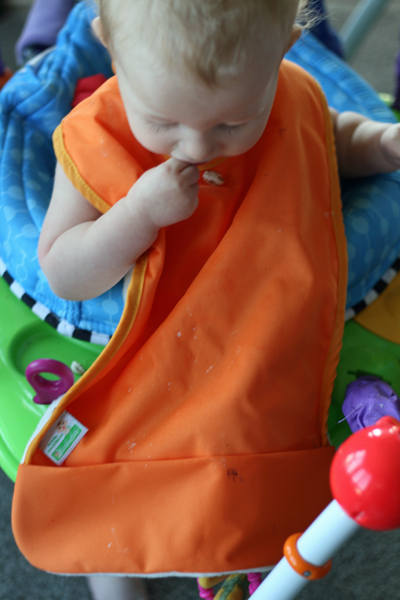 This bib was perfect for that scenario as it covered her entire body and lap and would catch crumbs all the way down to the counter. At times in the high chair we have now, this bib is a little too long, but it's still great for when I have to hold Aurelia on my lap to feed her (like when we're out at my parents' or at a cafe). One side of this bib is a super soft rayon bamboo fuzzy fabric. Really it can be turned inside or out, but I like keeping this soft side against her skin, especially when she's eating shirtless (who doesn't love minimizing stained laundry? ;) I like that she has something soft against her skin rather than something plastic-y in these situations. The outside is a waterproof PUL, perfect for all the leaky sippy cups we're dealing with these days. At the bottom, a small pocket does a great job of catching crumbs & run-off. 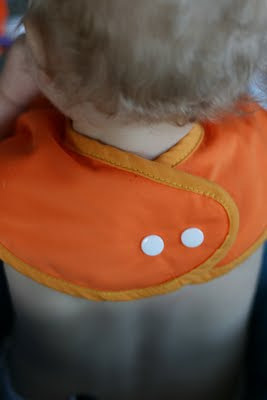 However, my favorite feature about this bib is that it fastens with snaps at the neck--the one fastener that Baby has not managed to figure out how to remove yet! ;) There are two snaps to provide some adjustability. Lastly, Yasmin from Driline Baby sent me three of their most tried & true favorites--their blue dog flannel fitted diaper. Available in three sizes (small, medium & large) and in both velcro & snaps, Yasmin sent me a variety to try out. Each flannel fitted also comes with a liner included (mine came with pretty red or green serged edges or even in a mirrored blue dog print!). The velcro fastening diapers have good, strong laundry tabs that were never a problem for me. 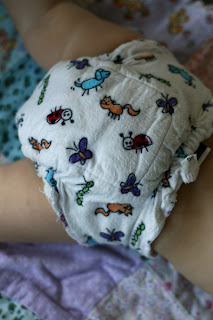 The snapping diapers had only one downfall--the snaps end closer to the hips (probably for aesthetic value), but I wish that there were one or two more snaps on the waistband (just under the bellybutton), as well as the cross-over capacity for snapping the tabs one over the other. These days we are at a bit of a strange fit in the waist, so the more snaps the better. In short, I would have liked to see these diapers have just a couple more snaps for the perfect fit (these would have helped to cinch in the legs a little snugger as well). The velcro dipes, however, got a perfect fit, so I know that the diaper itself is well-constructed. 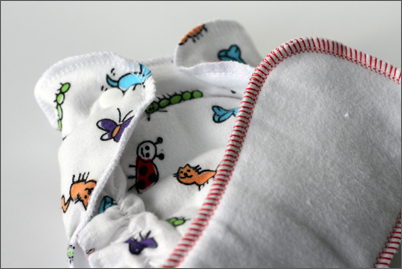 These flannel diapers are soft, breathable, and natural. For hot summer weather, we wear them without a cover around the house, and they do a great job of absorbing well before becoming damp to the touch (especially with the soft liners placed inside). For going out, a wrap or cover does the trick to keep them absorbing for long periods of time without leaks. These are great economy diapers, perfect for newborns (in size small) as they are perfectly natural, easy to change, and easy to launder & dry. They also typically retail for around $5 a piece, so they are extremely affordable! Though the blue dog print is most popular, there are other prints and looks available as well. Overall, it's great to continue supporting this amazing manufacturer from my hometown. Driline Baby does not sell directly to the public but has plenty of retailers for its products (if you are a retailer looking to stock something new, feel free to get in touch with Yasmin to chat about her products!). I feel that they have quality made products that have been around for years and years and have stood the test of time both in homes and healthcare settings here in Canada. Head over to Driline Baby right now to see which online retailers are carrying their products! 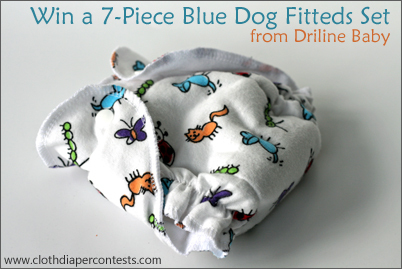 Driline Baby is also offering one lucky winner a 7-piece fitted diaper set, including 3 Blue Dog fitted diapers, 3 diaper liners, and one Dri-Wrap waterproof cover! Final details: I received no financial compensation for this review or giveaway, though I did receive the sample items free of charge. All opinions shared are my own, and I was not persuaded to share anything other than my own thoughts. Other users may have different experiences with this product than what I have shared. This giveaway will end on August 17, 2011 at 11:59pm MST and is open to residents of Canada and the USA only. Winner will be chosen randomly using random.org’s services. The winner will be contacted by email and will have 48 hours to reply before a new winner is chosen. The prize will be supplied and mailed out to the winner by the sponsor of this giveaway. Would love to try their Bamboo Baby diaper! i want to try the bamboo baby fitted, bamboo baby aio, a couple of the covers - like the side snap pants! I would like the try the mama cloth from Driline Baby too! I would love to try their Stay Dri Mesh diaper doublers. 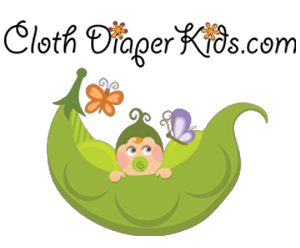 Follow CLoth Diaper Contests and Giveaways via GFC. I would like to try the bamboo aio. Especially the lilac color. I subscribe to CDCG by email. I'd also like to try the bamboo baby AIO. 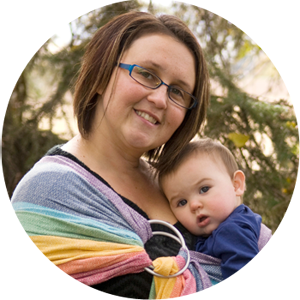 Networked blogs - not sure if this happens under the name The Balanced Mama or if its Mandy Sergent. I liked y'all on FB! i would love to try the terry no-fold. what a great idea that is! I would love to try the Driline SnaptoFit cover! 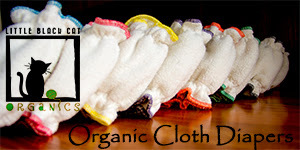 I like Cloth Diaper Contests and Giveaways on Facebook! I'd like to try the Dryline Snap to Fit cover. 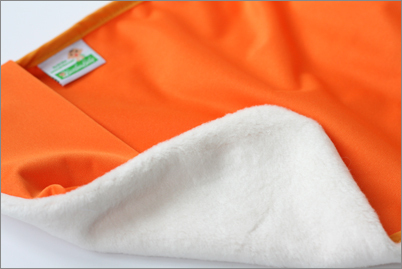 We have been told that covers and flats are a great option for newborns so I am interested in Driline's snap to fit covers and their chinese prefolds! I subscribe to email updates from CDC&G blog. I'd love to try the Bamboo Baby AIO! I like you on facebook as Samantha Allen. I have been a follower since very early on! Thanks for the chance.. been wanting to add some fitteds to my stash! .:karen:. I follow you through GFC via The Green House. I would like to try the form-fitted diapers. I like you on FB via The Green House. I follow you on Twitter via @GreenHouse_blog. I follow Driline Diapers on Twitter via @GreenHouse_blog.